Wildfowl and screamers belong to a highly diverse family of birds, confined to watery habitats. They are amongst the most attractive of birds and are very well-known to man, who has domesticated them, used their feathers for warm clothing and ornamentation, admired their flight, courtship and migration, caught them for food, maintained them in captivity for pleasure, and written about their doings in delightful children's stories, from Mother Goose to Jemima Puddleduck and Donald Duck. They occur throughout the world except Antarctica. Some are faithful to the same partner for life, others for only the few minutes of copulation. In some species, male and female make devoted parents, and yet there is one within the group whose female lays her eggs in the nests of others and never incubates. Diving as a method of obtaining food has evolved many times within the family. Most nest in the open but others in the tree-hole nests of woodpeckers and some in the ground burrows of rabbits or aardvarks. They may be highly social or solitary, defending a large territory. 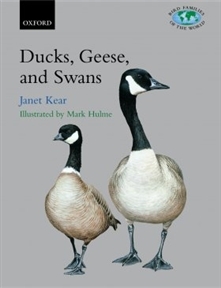 Ducks, Geese and Swans begins with eight chapters giving an overview of the family, their taxonomy and evolution, feeding ecology, breeding strategies, social behaviour, movements and migrations, population dynamics, and conservation and management, followed by accounts of 165 species, written by a team of expert wildfowl specialists, describing each bird in its natural state and summarizing the published literature and recent research. 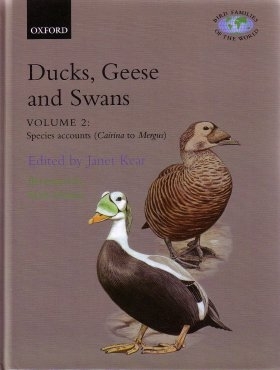 Complementing the accounts are thirty specially commissioned colour plates by Mark Hulme, along with numerous black and white drawings illustrating behaviours, plus distribution maps for each species.